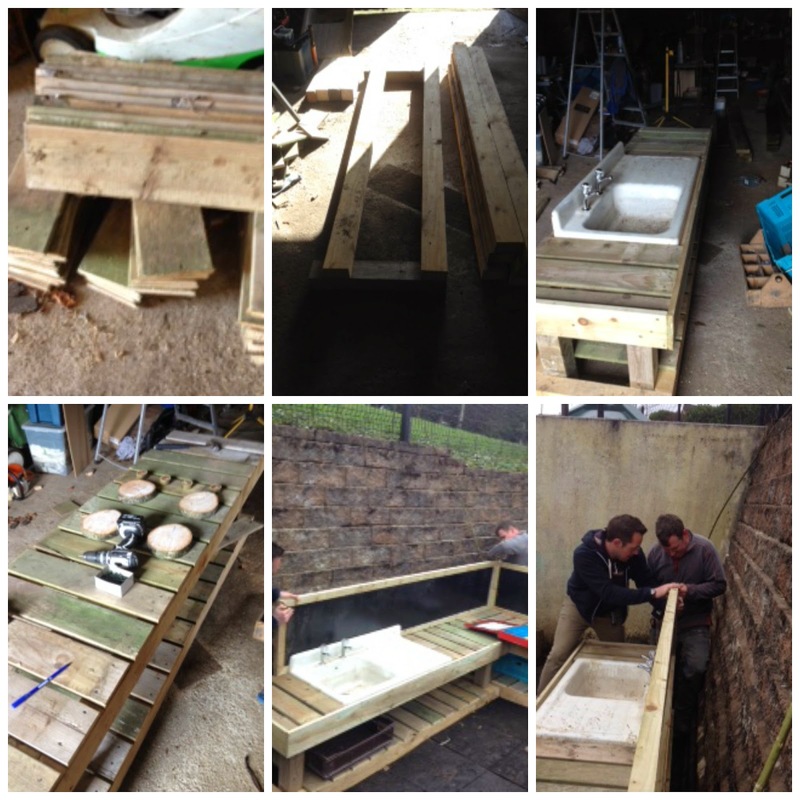 Learning for Life: A deluxe mud kitchen! An amazingly talented & generous friend to have! Through the world of social media I have made some amazing connections with educators around the world. It is great to 'chat' on line but even better to meet up in person. 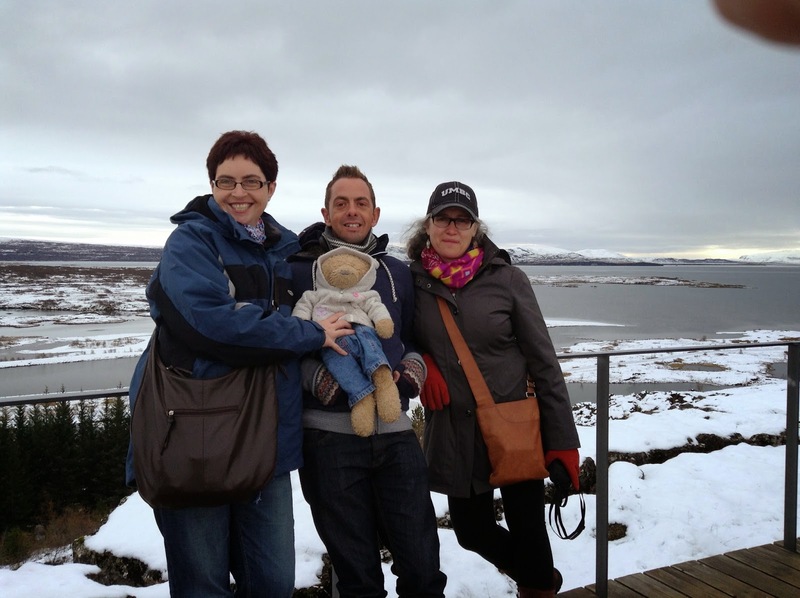 Last October thanks to the inaugural PlayIceland Outdoor Learning Conference organised by Fafu I was able to meet up with 2 online friends - Lesley from Takoma Park Cooperative Nursery School & Martin from Highway Farm Activity Centre in Iceland. It was great to discover we actually got on just as well in person as we did online! At the conference we all had to give presentations about our settings & I'm sure everyone who was there would agree that Martin's passion shone through the most of all & we all could see that there is something really special going on for children & families at Highway Farm. When the 5 days were up we were sad to say goodbye but at least Martin & I knew we were near enough to each other to be able to plan to meet up again pretty soon. Fast forward to March & Martin arranged to come over & spend 3 days in the nursery seeing how we do things in our setting. Having spent some time in his company I also knew that when he asked if he could do anything for us when he was over, he meant it, it wasn't just a polite question. We talked about creating something in Bear Woods but then decided that it would be better to do something more permanent in the playground that would be used everyday. So after chatting it over for a few weeks it was decided that Martin would build us a mud kitchen. When I mentioned this to one of the dads in school he offered to help & so a fantastic partnership was born! We exchanged photos of mud kitchens we had seen online & a final rough plan for one was decided. Adam, the wonderful dad, agreed to get all the building materials (I did think it was going to be pallets) & even sourced us a cast iron sink. He was so enthusiastic & nearly every morning had another idea for the kitchen to share with me. Martin arrived on the Tuesday evening & spent Wednesday morning in school with us, then Adam took him off to his place to measure up & cut all the materials ready to start building it on the Friday. In total, Martin reckoned they spent 5 hours on it! 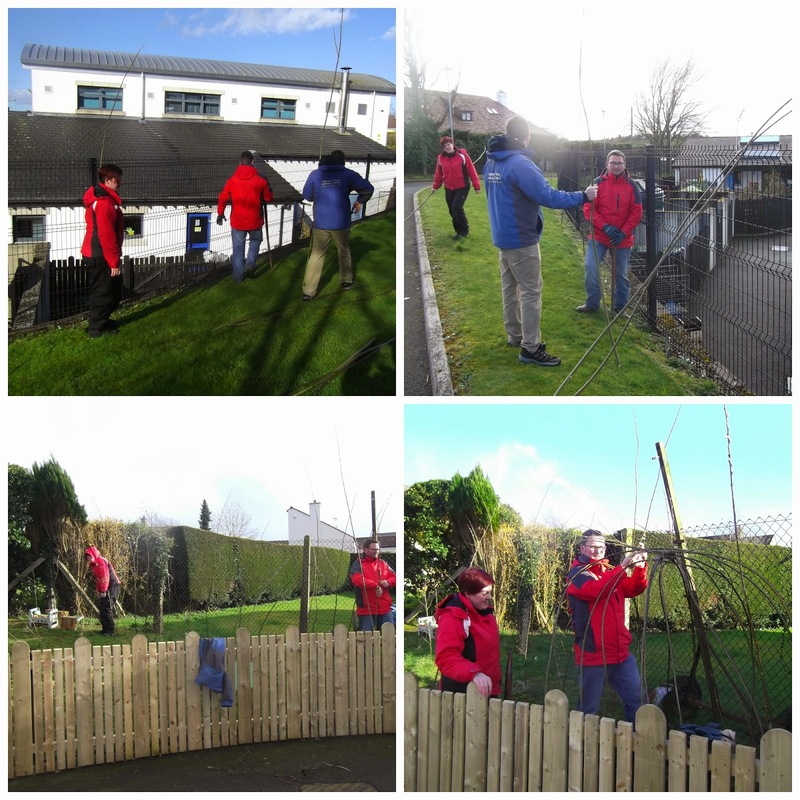 In between Martin (who has boundless energy) also managed to spend a day at An Creagan & persuaded Peter, their education officer, to come back to school with him & spend an hour & a half planting around 200 willow plants around the school grounds & make a willow den in Bear Woods. Sarah our fantastic NVQ student stayed back 2 of the days to help too & can now add willow weaving etc. to her CV! A bit of willow weaving & planting with Martin, Sarah & Peter. On the Friday morning, Martin joined us for our regular campfire cook out and simultaneously tamed some of our willow dens & leveled off the mud patch ready for the kitchen installation. 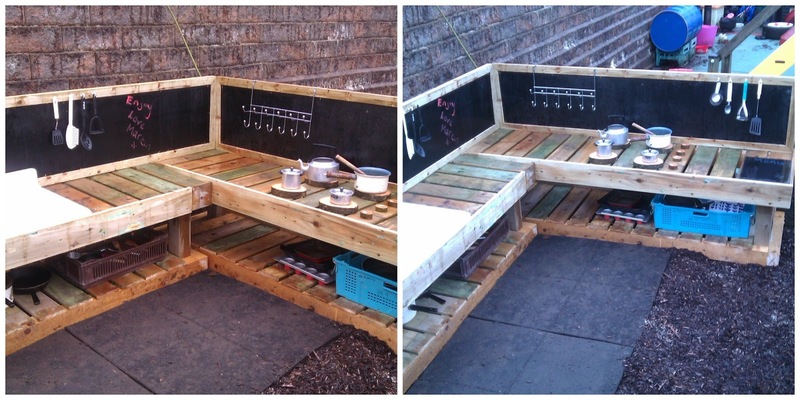 When he lifted the pallet off the ground (that covered a large deep hole in the mud patch) & set it up on logs & tyres the children really thought this was the mud kitchen & were so happy! 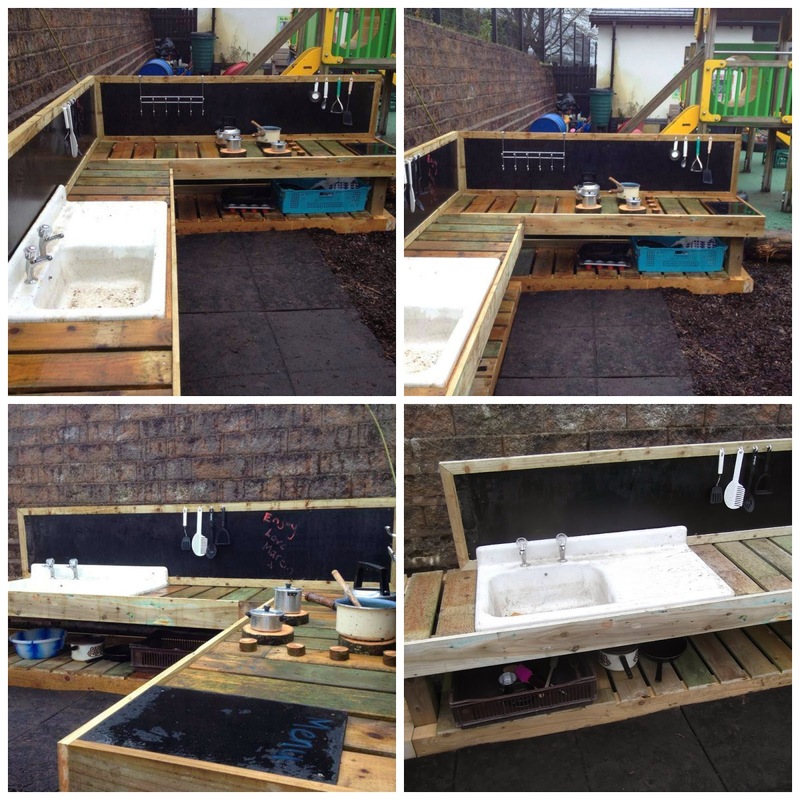 The children thought this was the mud kitchen & were delighted with it! Martin & Adam then went off site to build the kitchen up at Adam's house before bringing it back in 2 pieces to the nursery to have it installed just in time for the class to see if before they went home for the weekend. It was so lovely to see how excited they were by it, they went out in small groups to see it & when they came back I asked them what they had noticed. I got replies of "It has a sink, and clean taps - because they are new, and a cooker & shelves & things to cook with". As the parents arrived some were dragged outside to see it & admire it. I can't wait to see how they play & interact with this amazing new space on Monday & it really has added another dimension to our outdoor space. For the past few weeks parents throughout the school have been donating items for the mud kitchen so we have several boxes of pots, pans, bun trays & utensils. I don't think the children or staff can ever thank Martin or Adam enough for what they have provided for the nursery. 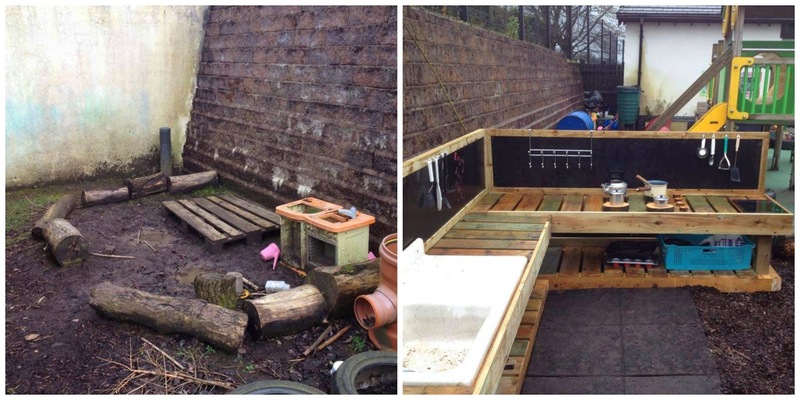 Our mud patch & 'kitchen' before & after! 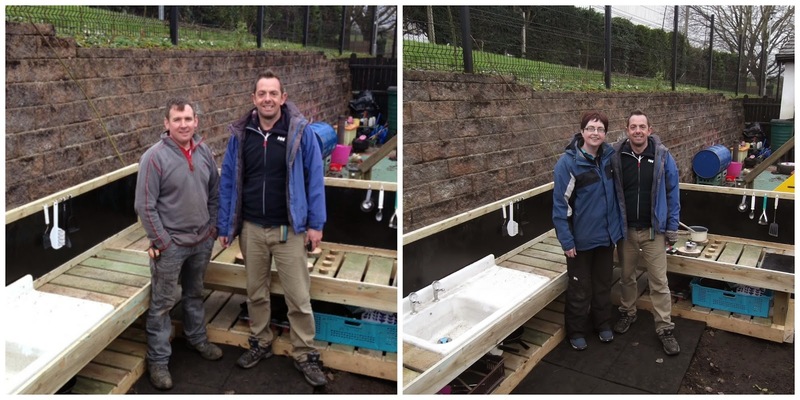 A long lasting friendship has been cemented & a connection between our 2 settings - Martin runs an outdoor preschool called Little Explorers - and staff from our setting hope to go & visit to get some more great ideas to bring back to ours to enhance our outdoor learning environment even further. Just so exciting. Congrats to you and to Adam and Martin and all the others who made this happen! It will certainly inspire so much play and joy for years to come! It will, looks like PlayIceland is the gift that keeps on giving! That is absolutely fantastic, what a brilliant idea! Thanks am really excited to see how they play in it next week! How fantastic - the children are going to have so much fun and creative exploration in this brilliant addition to the play area. Thanks for linking up and sharing with Country Kids. I know, it's such a fantastic addition, thanks for hosting such an amazing line up again? This is amazing. I am quite envious, yet inspired! 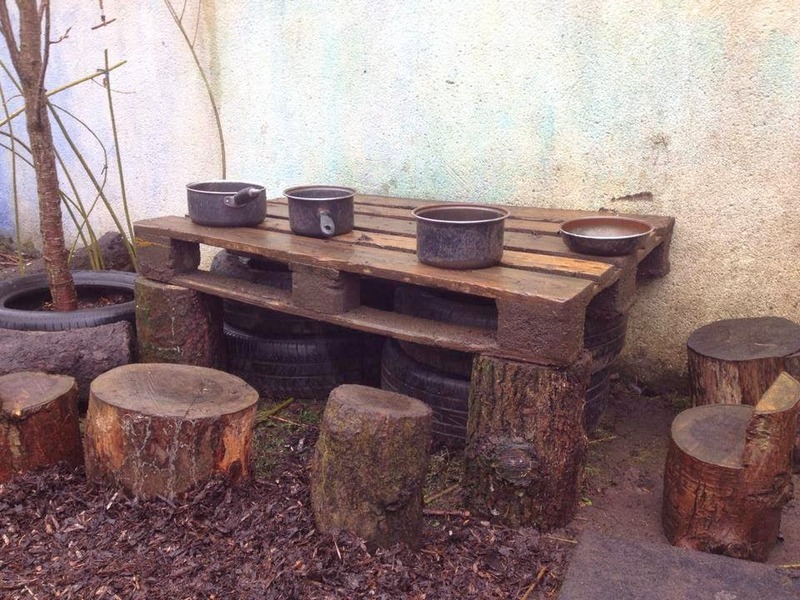 What a beautiful mud kitchen, logs AND willow den making! I am sure they will have so much fun! Thanks Katie, I just loved how excited they were by the whole process. 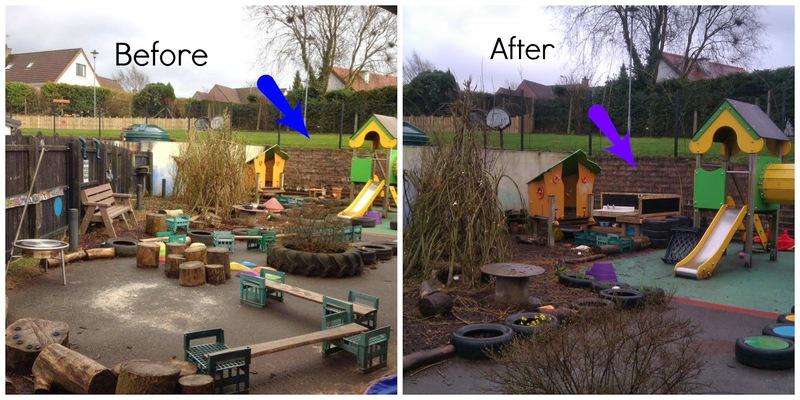 Hi Shay, I know, it has given us a fantastic new area for play & I can't wait to see how they use it.